Developed with beauty icon Claudia Schiffer the Ultime range is formulated to provide you with strong, shiny and truly precious hair. The crystal shine collection has been designed for dull and normal hair and its weightless formula has been formulated with liquidised crystals to smooth the surface of the hair restoring shine to leave it looking healthy and hydrated. I have been using the Schwarzkopf Blonde Ultime hair colourant and lightening products and was really impressed with them. Based on that, I thought I would try the shampoo from the same range. This smells wonderful and cleanses really well without drying out the hair. There tends to be a lot of silicones in products like this, so if your hair is fine or tends to the limp side, you may find it unsuitable. However it does give your hair a nice finish, particularly if you follow up with a shine enhancing conditioner and spray. I don't think I would pay the normal RRP of £4.99 for this, but its on sale in many places for £2.50, so well worth a try. 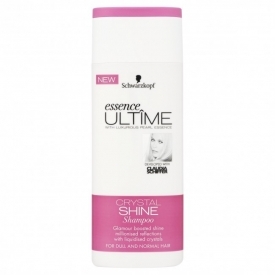 "I have been using the Schwarzkopf Blonde Ultime hair colourant and lightening products and was really impressed with them. Based on that, I thought I..."